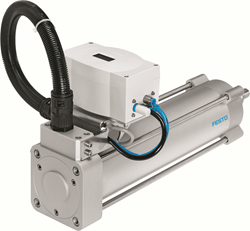 Festo actuation and control solutions are currently in operation on more than 300 flotation cells and have been shown to increase metal and mineral yield by as much as 10 percent or more compared with the conventional solution. In addition to flotation cells now being used in North and South America, South Africa, Australia, Europe, and Russia, Festo supplies automation solutions for hydrocyclone process control, damper actuation, automated control of water filtration systems, coal plough control, and other applications. Festo, one of the world’s leading suppliers of pneumatic and electric motion systems, provides productivity tools and the expertise of application engineers to speed up the ordering, delivery, and installation of integrated systems consisting of actuators, valves and valve assemblies, controls and control cabinets. Solutions are given customer specific part numbers, which facilitates reordering and simplifies inventory. Festo systems are rugged, dependable, long lived, and supported globally by Festo. At its MINExpo booth, Festo showcases a filtration tank with dart valves controlled by DFPI NB3s, the new Festo linear actuator with optional integrated position controller. The precise positioning of dart valves by DFPI actuators produces greater yield and higher profitability for mining operations. These actuators are rated at IP 65 to 69 K for harsh environments. Festo brings to MINExpo a display of automated angle seat valves, NAMUR valves, and butterfly, ball, and knife gate valve assemblies for automated control of liquids and gasses in key processes such as water filtration, flotation cells, and hydrocyclone systems. In terms of control, Festo features the innovative MPA-L modular, expandable valve terminal and the company’s powerful CPX industrial automation platform. Booth personnel will demonstrate online productivity tools that significantly simplify and speed up specifying and ordering. For more information on Festo solutions for raising yield, engineering productivity and creating superior performance in the mining industry, stop by the Festo Booth # 25001-S. For more information on Festo electric and pneumatic motion products and systems, call Festo at 800-993-3786 and visit http://www.festo.us.